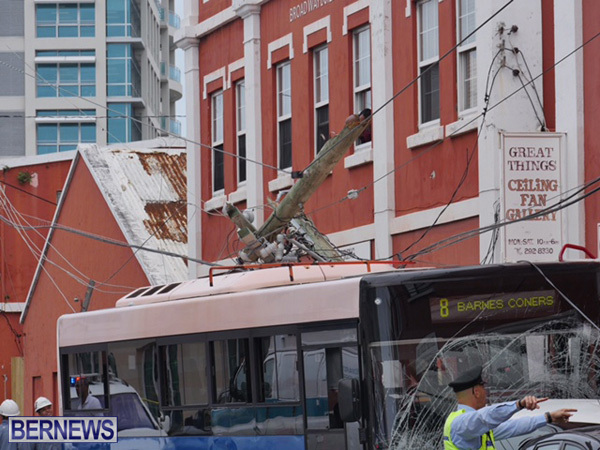 On March 11th, a bus crashed into parked cars and a utility pole outside of Great Things, resulting in eight people being injured and power being knocked out for 40 customers. 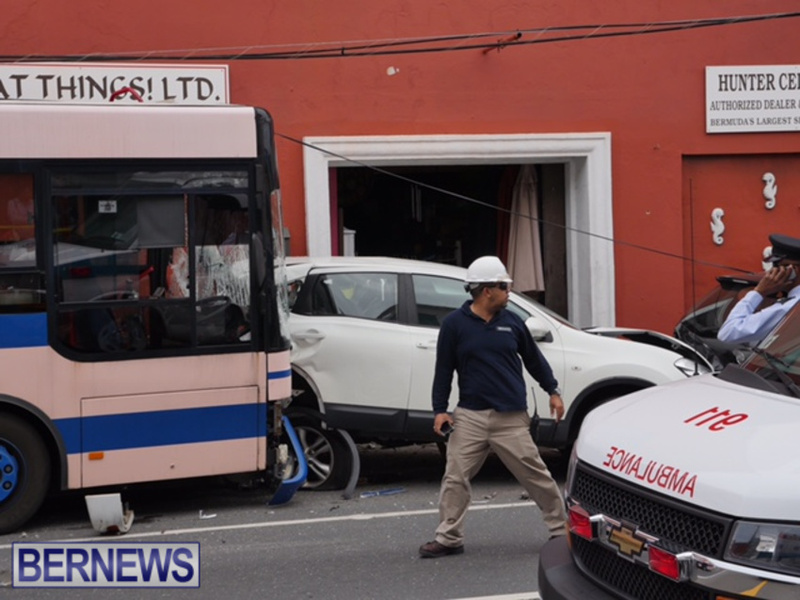 In a statement this evening, a police spokesperson said, “Contrary to reports in the media this afternoon, the bus driver involved in a collision that occurred along Crow Lane around 11:40am Wednesday, March 11th has not been charged with any offences at this stage and currently a court appearance is not imminent. 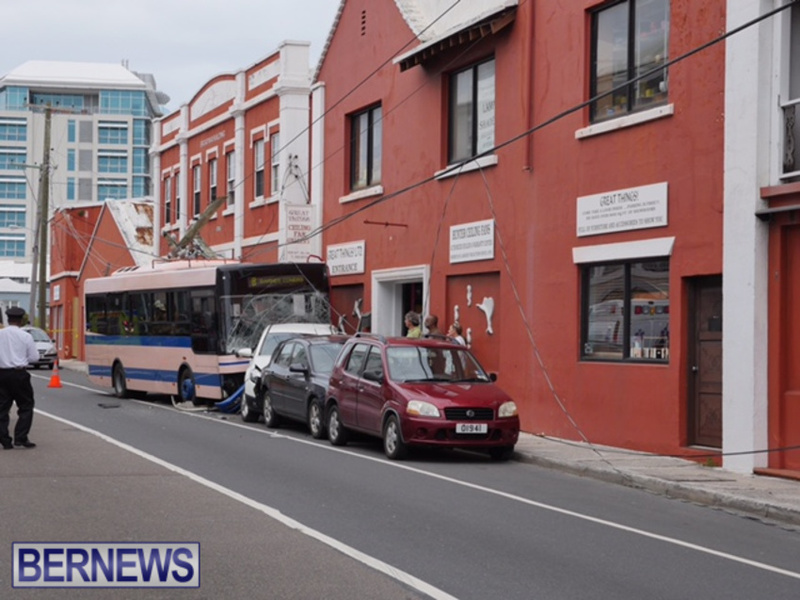 “However, the Bermuda Police Service can confirm that the bus driver in question has been arrested and released on police bail while inquiries into the matter continue. Oh no…that dont sound good at all SMH…I really hope not ! Absolutley!!! Strike is on the horizon?? Also looks Like the plp/Roban has once again gotten something wrong, he was just the other day telling everyone don’t read to much into this incident??? Will the plp ever get something right???? Really Kango, Did you have to make this political? Okay, yes Roban was wrong and perhaps to hasty to comment without the all the facts, but do you really have to show your bias and dislike for the PLP in every incident that takes place,, smh. Any relation to the Ferry Driver? I was thinking the same sort of thing but how is someone arrested, not charged, but released on bail? The Police bailing system is totally different from a Court bail dummy. ?????? The police are the enforcement and investigation side and the courts are the judicial side. She could be held for questioning or as a material witness but she can’t be arrested without a charge. Look for a clarifying statement from the police or the crown. You CAN be arrested and not charged. You can be arrested on suspicion of committing an offense. e.g. Arrested for possession of drugs, then bailed pending forensic examination. Only charged when results are positive. If negative you are realeased from bail. Released on “police bail”. Roban had it right when he said “don’t read too much into this”. Why should we have if we didn’t have facts. In addition whatever comes to this lady the only person she has to blame is herself. 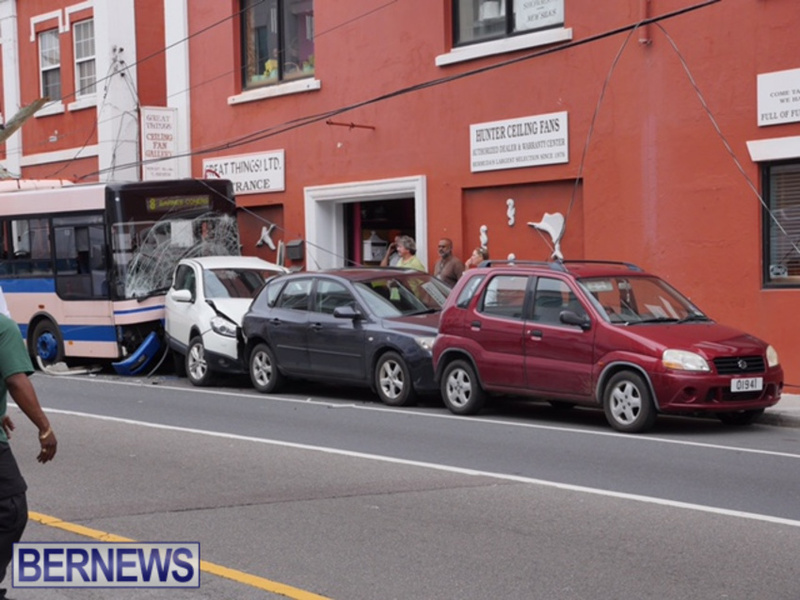 She’s fortunate that no one died or got severely hurt. If there was something wrong with the bus, how is she to blame? Please let the investigation take place before you place a judgement on the driver. I am sure she is extremely shaken up about the whole incident. um…sooooo y arrest em and y mention it to public? Arrests are on the public record. The accused has no right to privacy about the fact of their arrest. Bus drivers are BIU members dopey! you can arrest someone without charge? Of course. What would make you think any different? They would only ask because they don’t know. Duhhhhhhhhhh! I don’t get it arrest him but no charges. Maybe I should wait till PATI comes in and find out. Police bail is totally different from Court bail. One has to be charged to appear in Court. Yes but what was the reason the bus driver was arrested. Surely the police just don’t go around arresting people without telling them why. That would be a pretty good indicator as to what she may be charged with. Stay tuned for when the truth comes out, I will give you a hint, think back to the ferry boat operater??? This story makes no sense. But, stay tuned, I guess. I think they probably told her why. 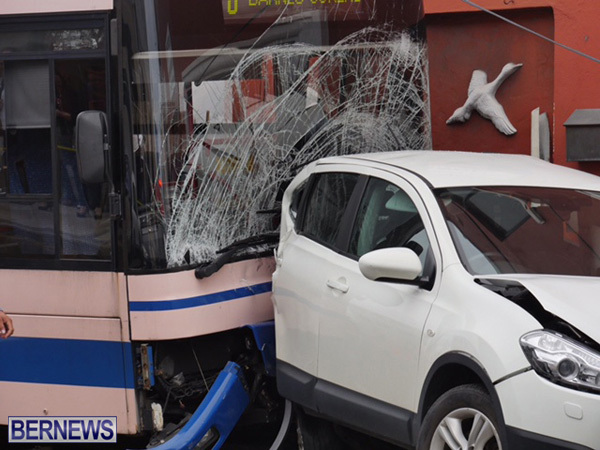 From reports from people on board the bus, she was speeding before the accident. I’m sure this was not this bus driver’s first offence. It’s very fortunate that no one was killed or maimed, especially as there were young children on board. Terry…before you get to the rum….do you know what the objective of this course of action would typically be? So that’s 10 drivers out on long-term sick and one arrested? I lost count. Charges are coming-she’s screwed.You defend people and then they go and let you down. If there is nothing mechanically wrong with the bus… Then “charges” are coming for sure!! Maybe the BPS are awaiting the results of toxicology reports – before making-their-move!! I just hope the BIU do NOT start any nonsense over this mess!! What a slap in the BIU’s face. Defend yah workers and then a bad apple does crap like this. Makes y’all look bad! What a stupid statement. But you always like to bring down your fellow Bermudians. (if ya even Bermudian). I don’t really understand. Arrested, released, but on bail, and not charged with anything. Isn’t there a contradiction here? Are we too jumpy to actually say why she was arrested? Brought in for questioning is the usual line but I didn’t know you could actually arrest someone then release them on bail FOR NOTHING. My bad. Exactly Joe. When Bail is granted under section 462 of the Criminal Code the form states that what offence the person has been taken into custody for. Read up on the law if you don’t understand. when there is a police investigation going on a suspect can be arrested, interviewed and then released on Police bail because they are still a person of interest. Then when the police have all there evidence in order and it appears the person in quesiton should be charged then they will charge them. By putting them on police bail they cannot leave the duristiction. hey Thanks for the info! But on the bail form it says what offence they are being detained for, does it not? I think that’s what we need to find out in this case. If y’all remember she was reluctant to get off the bus after the crash. It was not an accident. Maybe she thought that she was captain of the Titanic & she was going to go down with the ship. Whatever…this will be interesting. At least 1 car written off. Tens of thousands in damages. 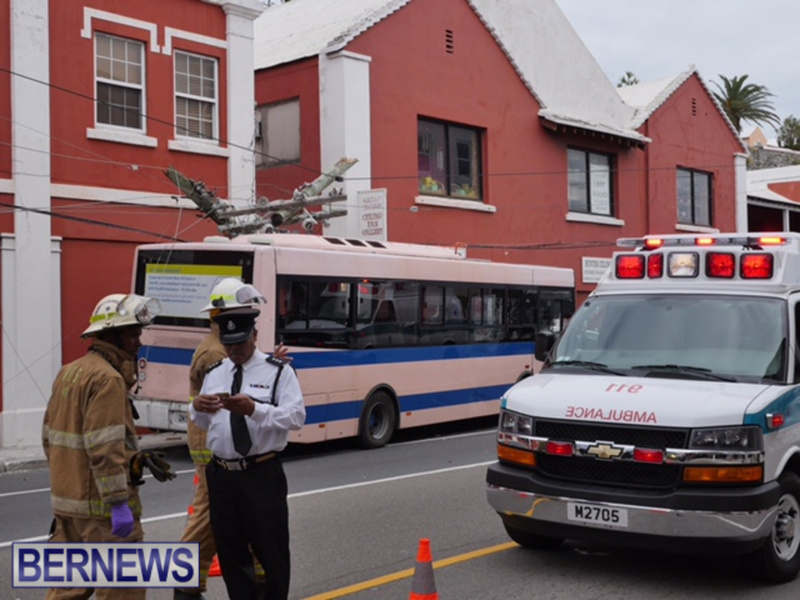 A days income lost for the retail businesses on East Broadway, inconvenience all day to thousands of drivers, police taken off other work all day to direct traffic. It all adds up to hundreds of thousands pretty quick. That is the $64,000 question – as the saying goes!! I hope the BPS made sure that a full and complete DUI screening was made for both alcohol and drugs!! Her reluctancy to get off the bus is all that more “puzzling” at this point!! The BPS promised full and complete “transparency” over this very serious matter!! So much for the “she had an episode” explanations. Or the ones about how the OBA don’t maintain buses. before jumping into conclusions ! I would assume that they arrested her so that they can do a deeper and proper investigation medical etc that other wise not be available to the investigation. I would hope the bus is faulty due to lack of proper maintenance to say the least. 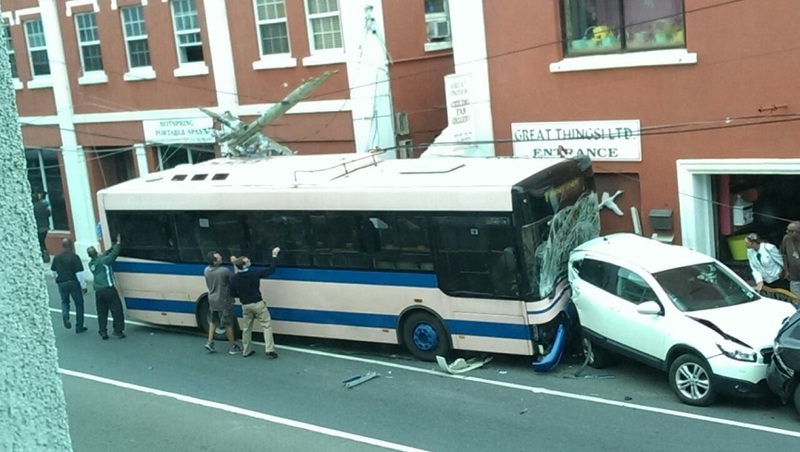 What makes you think that the bus is “faulty”…. And NOT the driver?? only affording someone the benefit of the doubt people if look at the dislikes I was giving are ready to lynch someone who could potentially be innocent. because of the automatic gear shifts the chance of the bus having accelerated on it’s own do exist! 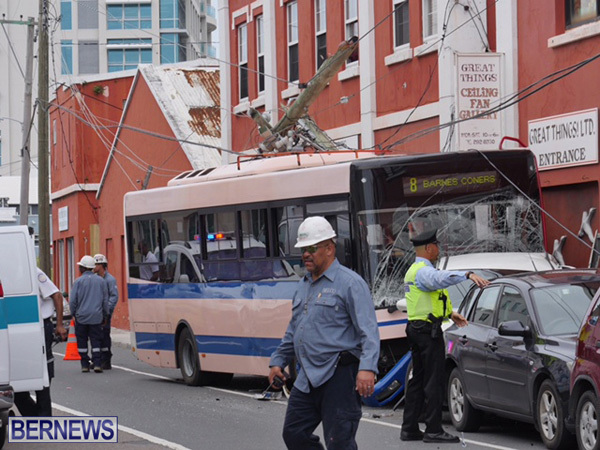 I would hope if the bus was faulty that is SHOULD HAVE NEVER BEEN ON THE ROAD WITH STUDENTS IN IT! HEADS SHOULD ROLL IF THAT WAS THE CASE!! 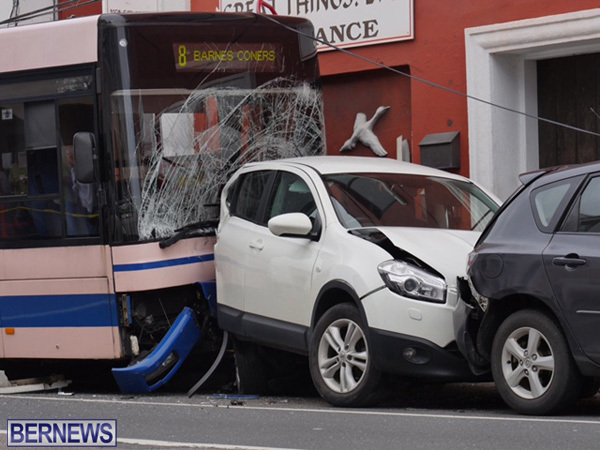 judging by the amount of buses said to be off the road for mechanical issues on recent news threads , I can only form an opinion that the chance of putting a less faulty bus on the road are probable in order to keep the schedule as normal as possible . also not knocking the mechanics but I do remember a news thread or article that mentioned mechanics from the bus manufacturing coming to assist in the repairs of some of the buses. I would rather hope that a mechanical problem is discovered to find a fix and prevent future incidents, as well as if it is the drivers fault it will not be as easy to fix as a mechanical issue and further more a life completely ruined as well. if the drivers at fault then the law will deal accordingly but as a person showing a little bit of hope. I would like to commend the Renre Employees for helping the kids out. It was amazing to see the CEO and top underwriters etc helping the kids get out of the bus, get water, be fed, and get looked over by the fire men. Others were on the scene as well (gas station employees, people from the docks etc) but as an employee watching the scene in the RenRe lobby it was heartwarming! Ok you all can go back to your negative vibes now..lol..
Oh, is that Ren Re, one of those IB companys here that never do anything for Bermuda? Where is the scarcasm button? Just saying if she didn’t have the accident, shed never got caught we better strike. Meet you on the hill. BIU takes a lot of slack defending there own, this is how you thank the BIU. 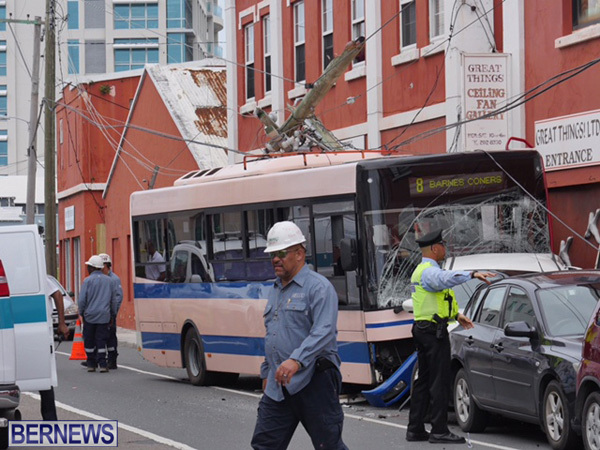 Start mandatory testing on all, probably be a lot less buses on the road then we have now. “Caught” doing what exactly?? There is a whole lot more to this story…and right now it is no one’s business other than the driver, police, unfortunate victims and DPT! To the driver I know who you are..keep the faith..cause when these dramatic fools know the truth the will eat crow!! Hmmmm…. She was reluctant to get off the bus after the crash!! WHY?? How can you arrest someone and then NOT charge her with an offense(s)!! That makes absolutely NO sense to me!! What are the police hiding from the general public already?? No comments from BIU re this incident? Surprised they haven’t arranged a meeting and disrupted the bus service further. Not the first time they have shown support for one of their members even though they were in the wrong. Under PACE, the police have a certain amount of time (after the initial arrest) in which to charge someone for an offence. However, they also have limits on how long they can keep someone locked up depending on the severity of the offence(s) they were arrested for. Most times, they will be forced to release someone before they have had enough time to gather all the evidence they need. Especially if they have to wait for blood test evidence or statements from Doctors, etc. Therefore they would have no choice but to bail an offender to return before their time runs out to charge that person. Then they will either charge the offender when they return to answer bail, or they can re-bail (once, I think) for another date, or they can release that person without charge due to lack of evidence to proceed with a case. arrest her for what? being a victim of an accident? Why aren’t all bus & ferry drivers given drug tests ? They are carrying and responsible for people every day. Anyone providing professional transportation services should be tested. We need a random drug testing program for ferries, bus, and taxi drivers. Police may arrest someone if they reasonably suspect an offence has been committed by that person. Arrest simply means to detain. Following arrest, the suspect is read their rights, and then interviewed as part of the police investigation. 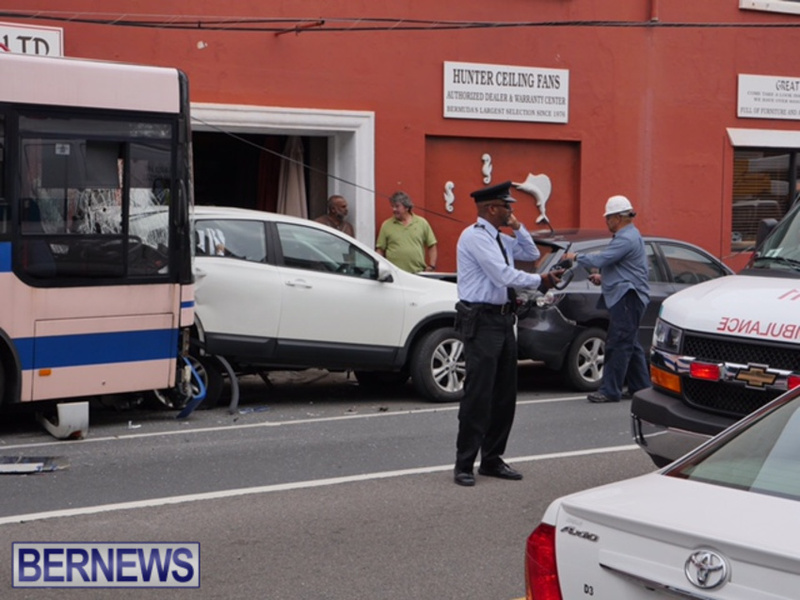 The person will usually be bailed pending a full investigation into the circumstances. If the police find evidence of wrong doing, they can recall the bailed suspect and charge him or her with the appropriate offence, and thereafter the suspect is brought before the courts. If the police find insufficient evidence of an offence the person is released from bail. Any CDL (Commercial Drivers Licence) holder is subject to random drug tests if you are actively driving a commercial motor vehicle in the States. Don’t even think of having alcohol in the truck, opened or unopened. Really anyone driving a heavy truck or bus should be tested. If you’re a professional you shouldn’t have a problem with this. As a private driver you had better not have an open container, even unopened in the front of the vehicle. In Bermuda, put it in a paper bag. No problem.